Welcome to TGIFF! If this is your first time here, I hope you like what you see 😊 If you do, I'd love to have you sign up for The Bulletin, my monthly newsletter. Each month, on the 16th, I share some of the news from here on the blog, a family favourite recipe and a fun themed round-up of things to make. 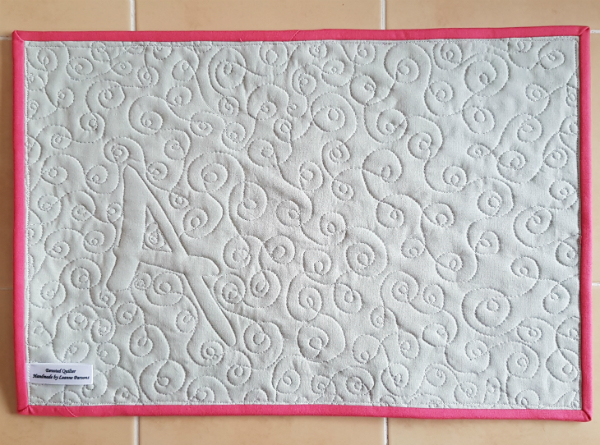 When you sign up, you'll also receive a copy of my Wind Farm quilt pattern, available exclusively to subscribers. 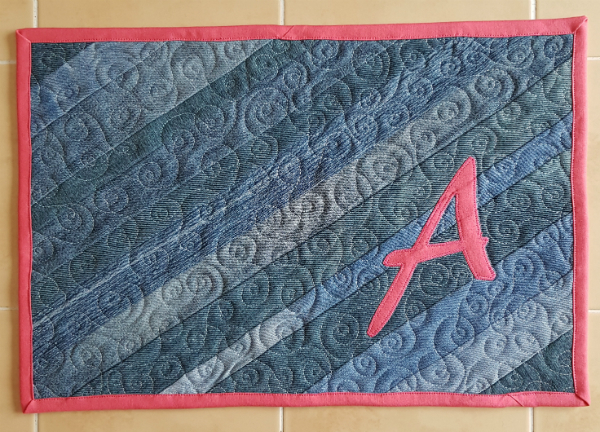 'Tis the season for secret sewing, but thankfully some of my recipients are much too young to be snooping around a quilting blog looking for hints about their gifts, lol. I decided to make personalized placemats for the kids I babysit and a few other kids on my list. 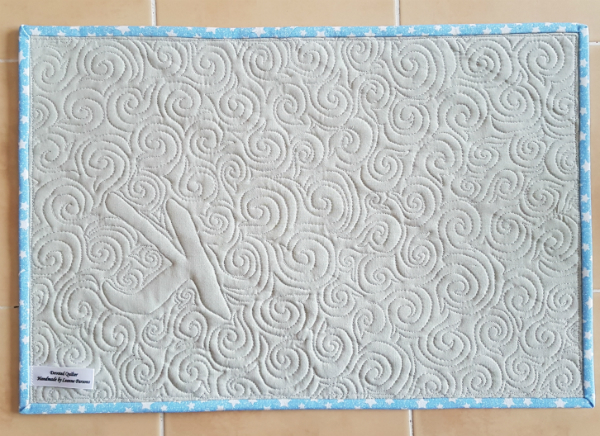 All told, I'm making 8 placemats. The plan had been to have all 8 finished for today, but that didn't happen. Instead, I have 2 finished, 2 basted and ready for quilting and 4 more waiting to be basted. Slow and steady wins the Christmas race, right? 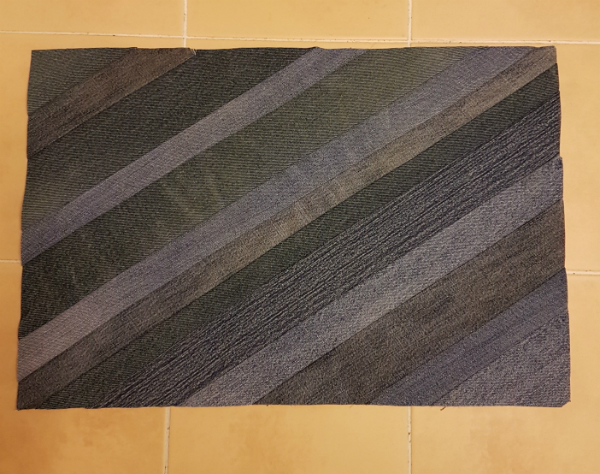 I made the tops of the placemats using recycled denim. I have a closet full of old jeans and I love finding ways to use them. It's like free fabric! Plus, my denim log cabin placemats have seen heavy use for almost 2 years and they still look almost pristine, so I'm sure the denim can stand up to toddler/preschooler/school age kid messy eating and still look good for awhile. I made the tops the same way I made these denim cushion covers, using an old sheet cut to 12" x 18" as the foundation layer. 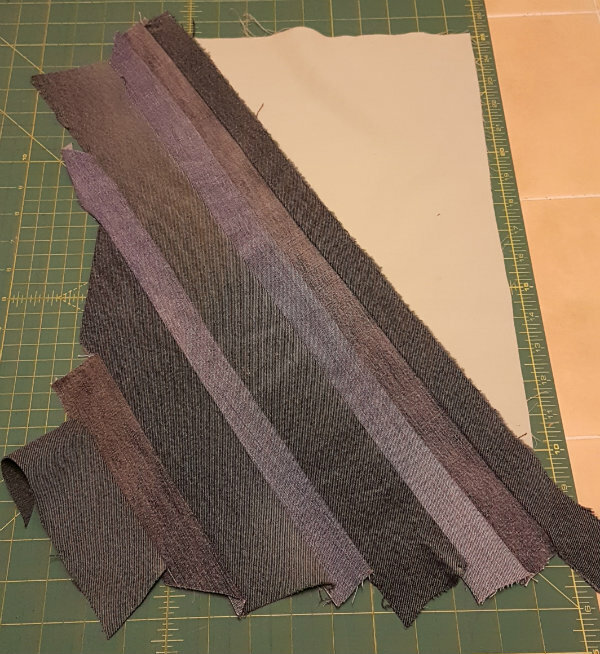 The sheet was a little flimsier than the fabric I used before, so it wasn't a great foundation layer. It was hard to keep the sheet straight, and some of the denim strips ended up being a little bunchy in places. That will definitely be something to consider next time I'm looking to use old fabric as a foundation. Once the backgrounds were pieced and trimmed, it was time for the personalization. I printed the first initial of each of their names in a nice font, really big, so it filled about half of a sheet of paper, turned landscape. Then I just cut the letters out and pinned the paper to the fabric and cut around them. A little washable glue stick and a quick zigzag stitch and the letters were attached. 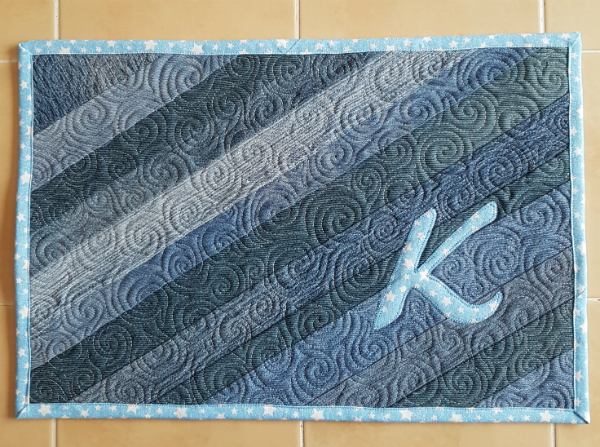 This K one was the first one I quilted. I used the swirl hook design, but I don't think I'll use that again. First off, it took twice as long as the loopy design and it didn't quilt as nicely on the denim. 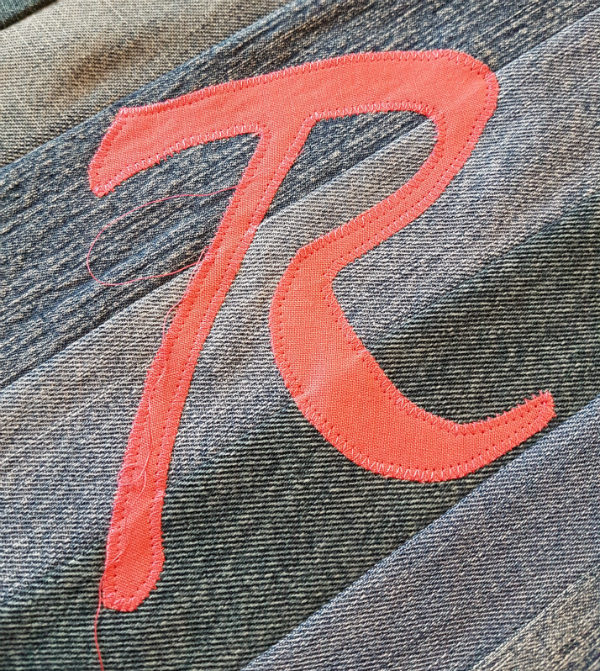 Partly that's because of the bunchy spots from the foundation being flimsy and partly it's because the denim is just so thick in places that it was hard to stitch smoothly. The echoed loop design went much faster and created fewer ripples. 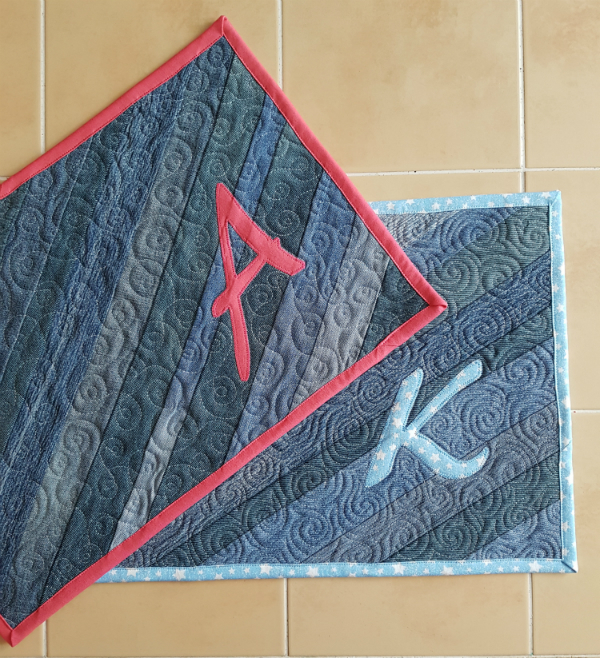 Each placemat is made using that kid's favourite colour, for both the initial and the binding. I really love how this pink (Kona punch, I think) really pops against the blue and black of the denim. So, that's 2 down and 6 more to go! Now it's your turn. Link up your finishes and tour around to celebrate some others finishes. It's more fun when we celebrate together, right? What a great idea! The use of denim makes them so sturdy and kid friendly! Love the idea of adding the letter. Those kids are going to be so happy! One time I made 16 placemats one after the other...yes, slow and steady!! What a great use for the denim, so durable. I love how you matched the binding to the applique, great idea! Thanks for hosting TGIFF, Leanne! OK. These are super cool! Fantastic use of the denim, and they look terrific. They look terrific Leanne! I love that pink against the denim too, and what a great idea to make sturdy and attractive placemats! Bet the kids will love them. OMG!! I absolutely LOVE these!! Anything with recycled denim, basically. What size did you make these? A friend and I recently had a debate about placemat sizing. Such a sweet gift for little ones. The will be so excited to see their initials and have their own special placemats. So cute! They will love that the placemats are personalized.